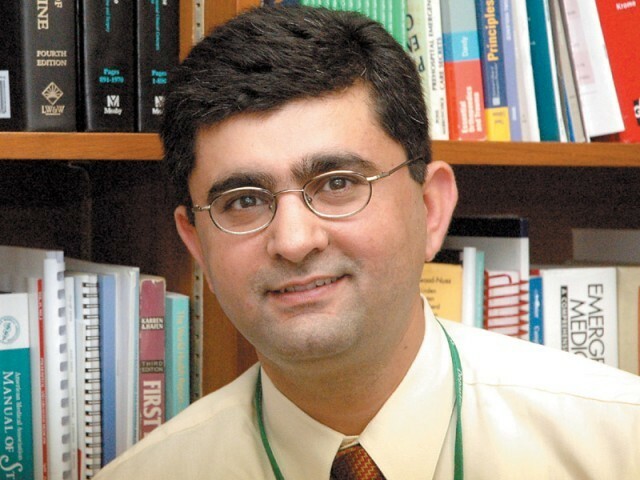 Dr. Junaid Razzak is a renowned emergency medicine expert and the executive director of the Aman Foundation. He started his schooling at a humble primary school in Lyari, and subsequently attended Adamjee Science College where his impressive grades and unbounded enthusiasm won him a scholarship at the prestigious Aga Khan University Hospital (AKUH). In 1996, his residency and training programme at Yale University’s School of Medicine started and in 1999, he was given the ‘Best Trainee’ award by the State of Connecticut. Razzak did his PhD in Public Health at the world-renowned Karolinska Institutet in Sweden, where he focused on the use of ambulance data for monitoring road traffic accidents. Finally, in 2005, the studious boy from Kharadar returned to Pakistan as a successful, qualified expert in emergency medicine. He joined his alma mater, AKUH as a faculty member and went on to successfully found Pakistan’s first emergency medicine service (EMS) training programme at the university. Determined to remove, for others, the hurdles that he himself had crossed only after many toils, Razzak collaborated with the College of Physicians and Surgeons Pakistan (CPSP) to organise a curriculum for the specialised field. At just 40, this medical expert has achieved what most people can only dream of in a lifetime, but he still has big plans for the future. Razzak will shortly launch a tele-health service for Aman Foundation and dreams of building a world-class health facility in Pakistan. Dr Razzak is truly an inspiration. What an amazing story. Mashallah, Subhanallah – keep up the good work.